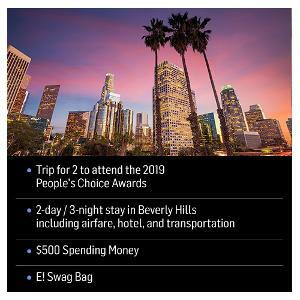 Prize: Trip for 2 to Beverly Hills to attend the 2019 People's Choice Awards. Includes 2 days, 3 nights stay in Beverly Hills, with airfare, hotel, and transportation. $500 spending money. E! Swag Bag. Statistics: This contest was opened by 38 and entered by 6 ContestChest.com members. 16% of those who opened the contest, entered it.